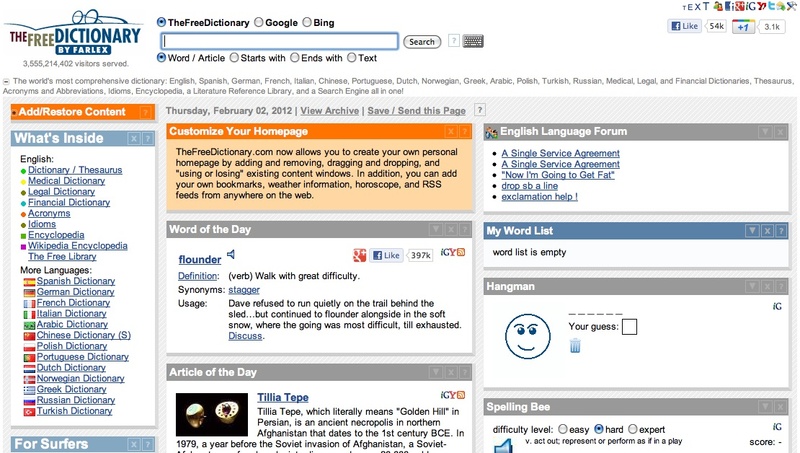 The Free Dictionary is an integrated and free engine, which compounds different encyclopedias, thesauri and dictionaries, whose contents are provided by different and well-known sources. It includes English, Medical, Legal, Financial, and Computer Dictionaries as well as Thesauri, Acronyms, Encyclopedias, a Literature Reference Library, and a Search Engine. Resources are well organized and for each keyword multiple-entry detailed descriptions – provided also with info and meta-info – are available. For each concept or word searched internal and external links plus various definitions are displayed. The amount of free resources available is very high and for Political Scientists there is a Legal Dictionary, plus internal and external references for the Political Science domain. Info are very frequently updated. Some access limitations (a subscription is required) exist only for the Hutchinson encyclopedia, which includes multimedia contents. The website is not difficult to understand and navigate, but there are not many help tools for non-expert users so that the considerable amount of info may be difficult to understand immediately. The interface design allows for a great interaction with contents thanks to the hypertextual nature of all words included in a definition and to the ?Free tools for surfers?, enabling a good level of customization and interactivity.